Malinda is primarily responsible for client relations and day-to-day operations. 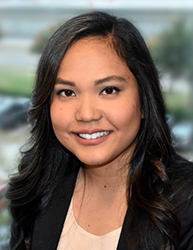 Prior to joining Beacon Pointe, Malinda was with WFG Investments for over eight years where she worked in customer service providing support for clients and financial advisors in many different areas. She graduated from the University of Phoenix with a Bachelors of Science in Business Concentration Administration. Malinda is married with two children, and during her free time, she enjoys cooking with her husband, spending quality time with her family in the outdoors, and exploring new adventures.